We offer an array of classes for all age groups. Tuition is based on 50 weeks (classes) and does not include the annual $25 registration fee. There is a 20% discount for each additional class and/or sibling. Tuition is due on the first of each month and enrollment is continuous unless we are notified via a Stop Class Form. You can enroll in classes at any time; tuition will be prorated based on your start date. In case of unfavorable weather conditions, please call the office or go to fLipSpotgym.com for class cancellations. Make-up classes can be scheduled with the office or you can make up classes with a Clinic, Open Gym, Open Tumbling, or Friday Night Flip Out. (please note age requirements for these classes). Anyone participating in a fLipSpot activity must have a signed waiver. Sports shorts, tight fitting top or a leotard. No jewelry of any kind. No snaps, buckles, buttons, or zippers. Socks are optional. Athletic shoes should be worn. Hair pulled back into a ponytail. Sports shorts, tight fitting top or a leotard. No jewelry of any kind. No snaps, buckles, buttons, or zippers. This playful, structured 45-minute coed class involves strong parent participation. 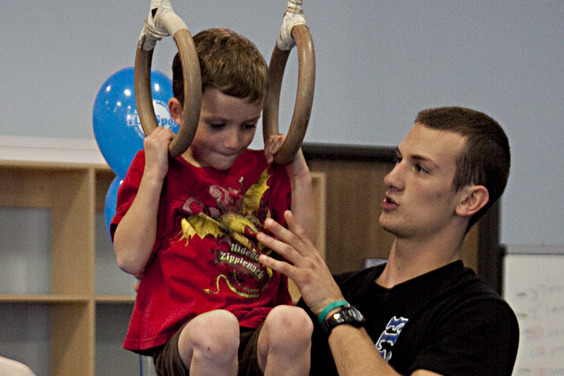 Concepts included are movement, motor control, manipulative skill development, rhythms, and simple gymnastics elements. Students will use many types of gymnastics equipment in this creative learning environment. For boys and girls ages 3 to 4 years with an introduction to basic gymnastics also focusing on fine motor skills. In this 1-hour class, the young gymnast works independently with the instructor. Exploring and expanding her skill development through verbal and physical repetition. 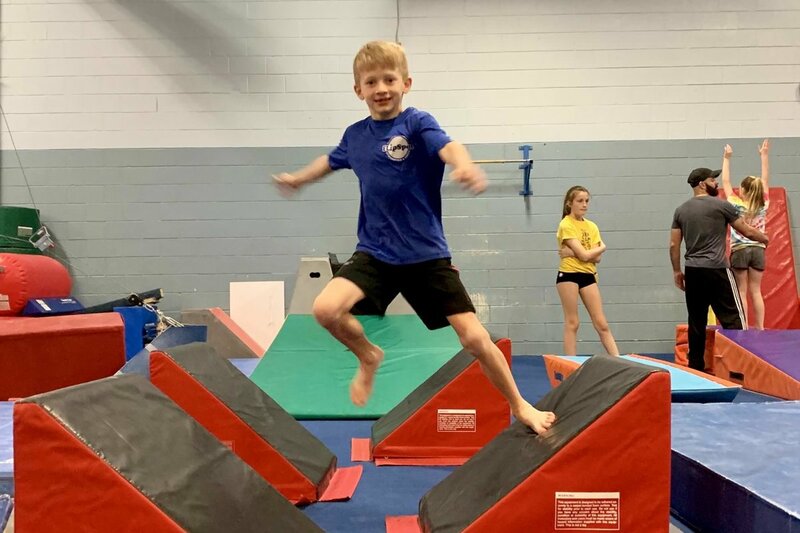 All equipment is used including bars, balance beam, trampoline, P bars, pommel horse, high bar, rings, vault, and floor exercise. Listening skills and simple skill progressions are incorporated. Classes are divided up by skill and age. Students will train on the tumble track, trampoline and spring floor. Intermediate and advanced students must be evaluated before enrollment. For those that want an alternative to traditional gymnastics. This class will focus on obstacle course training. Jumping, Rolling, Climbing, and Flipping are just some of the skills your little ninja will train. Students will learn to land safely, roll, jump, climb and flip. Classes are split up by skill level. To advance students must test out of their current class. Students must wear athletic shoes. 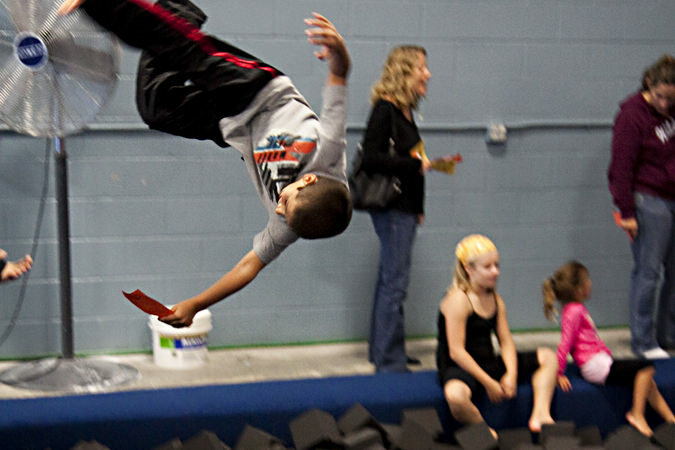 Students will learn basic trampoline skills and safety in this 45-minute long class. Skills will be taught according to the individual student’s ability. 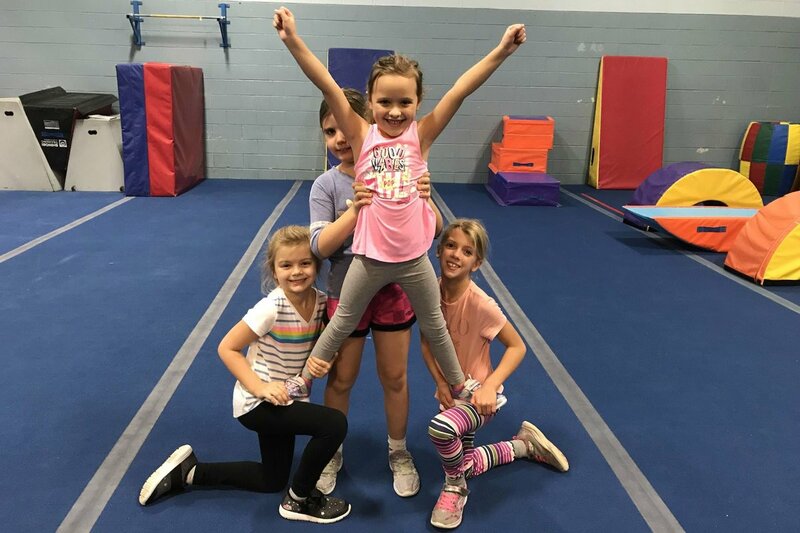 This class is for boys and girls interested in learning basic cheer techniques including tumbling, flexibility, stunts, and choreography. In this 1-hour class, the young gymnast works independently with the instructor. Exploring and expanding her skill development through verbal and physical repetition. All equipment is used including bars, balance beam, trampoline, vault, and floor exercise. Listening skills and simple skill progressions are incorporated. 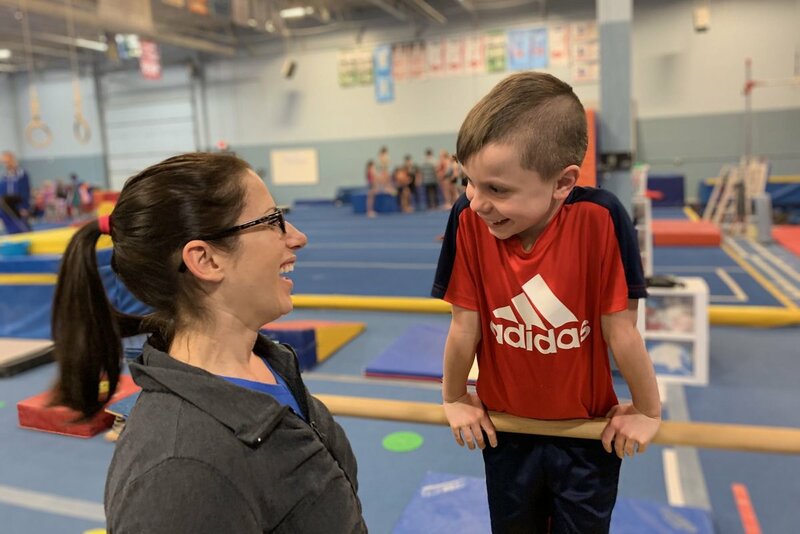 Students in this 1-hour class are taught the basics of gymnastics through a progressive method of instruction. Flexibility and strength are introduced to complete a well rounded gymnastics experience. All gymnastics equipment is used. Movement to other levels are by skill. 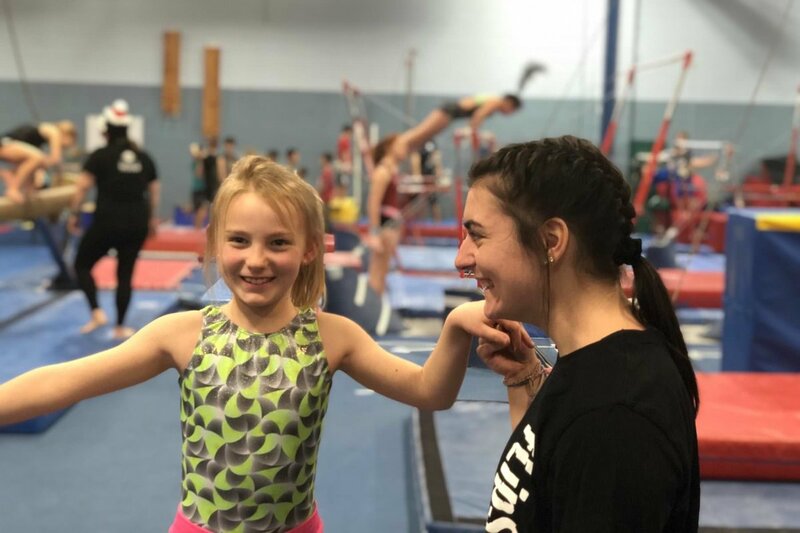 Students in this 90-minute class are taught the basics of gymnastics through a progressive method of instruction. 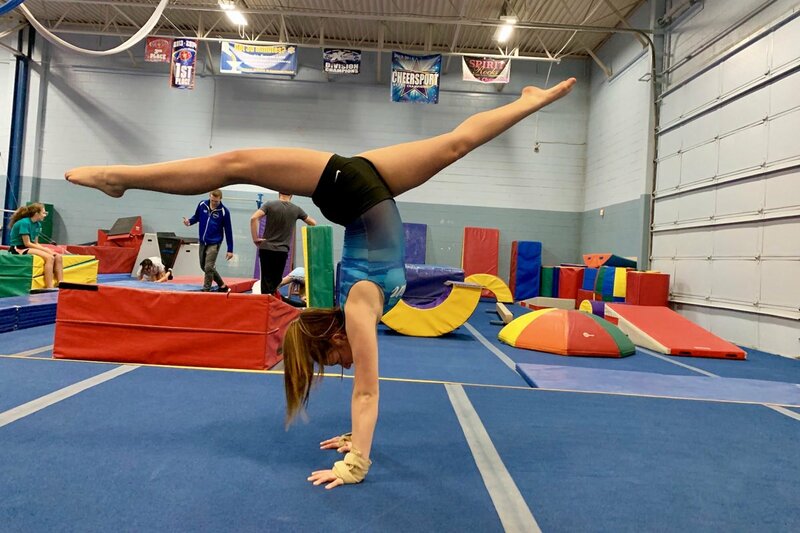 Flexibility and strength are introduced to complete a well rounded gymnastics experience. All gymnastics equipment appropriate for this level will be used. In this 1-hour class the young gymnast works independently with the instructor. Exploring and expanding his skill development through verbal and physical repetition. All equipment is used including P bars, pommel horse, high bar, trampoline, rings, vault and floor exercise. In this 1-hour class the young gymnast works independently with the instructor. Exploring and expanding his skill development through verbal and physical repetition. All equipment is used including P bars, pommel horse, rings, high bar, trampoline, vault and floor exercise. In this 90-minute class the young gymnast works independently with the instructor. Exploring and expanding his skill development through verbal and physical repetition. All equipment is used including P bars, pommel horse, rings, high bar, trampoline, vault and floor exercise. This free-form drop in class is supervised by one of our senior instructors. All areas of the gym are open for exploration. This open workout caters to the adult enthusiast and can be a great way to improve both skill and flexibility for this and many other sports. This class is for any adult that wants to learn the fundamentals of Capoeira. Capoeira is an ancient martial art created by African and Brazilian people long ago. It is a beautiful blend of body expression, dance, music, and movement. Aerial silks is a exciting new art form as seen in Cirque du Soleil. It combines the beauty of dance with the adrenaline of flight. Learn how to move your body through space in ways you never imagined, while developing core strength and flexibility. Supervised open format to tumble, flip and have fun! Parent/guardian must be present in the gym. Supervised open format for ages 12+ to tumble, flip and have fun! 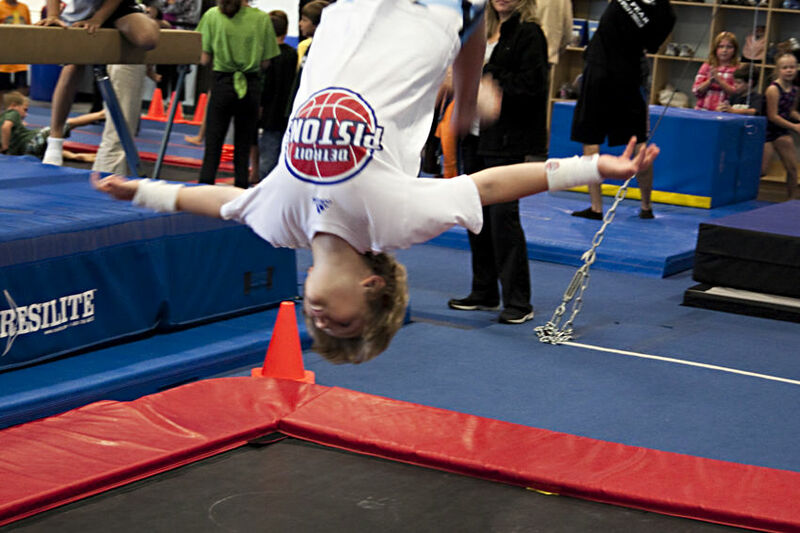 Supervised open format for all ages to tumble, flip and have fun! Any child 6 years and below must be accompanied by an adult in the gym at all times. Friday night open gym for teens only. Music, pizza, drinks and lots of fun provided. Friday night open gym for teens only. Music and lots of fun provided. 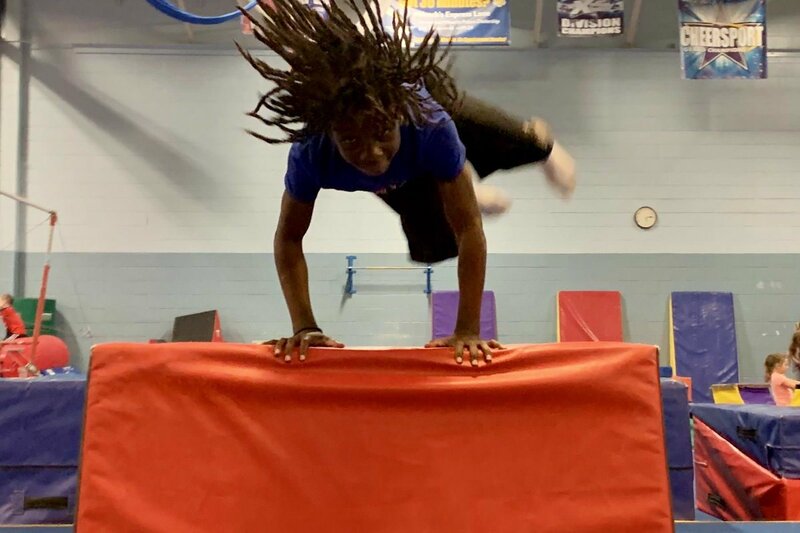 This one-hour clinic is for boys and girls that want to learn or perfect both handstands and cartwheels. This one-hour clinic is for boys and girls ages 7+ interested in learning a back handspring through progressions and conditioning. This one-hour clinic is for boys and girls ages 7+ interested in learning a standing back tuck through progressions and conditioning. This one-hour clinic is for boys and girls ages 7+ interested in learning a back walkover through progressions and conditioning.